The sliding valley located in the southwestern part of Shikoku is one of Japan's leading canyoning spots. 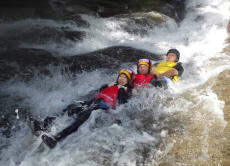 Not only is there a large number of natural sliders, including the waterfall of the snow ring chosen as one of the 100 waterfalls in Japan, as well as other elements are also designed for balancing well-placed canyoning I will. Please enjoy this new sense experience!